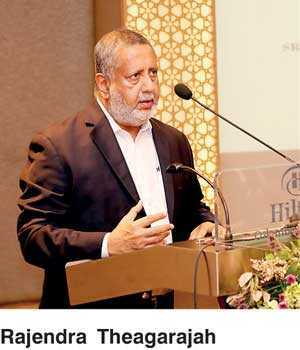 The Sri Lanka Logistics & Freight Forwarders’ Association (SLFFA) held its 37th Annual General Meeting on 6 July at the Colombo Hilton Residences. The Chief Guest for the occasion was Rajendra Theagarajah, Managing Director/CEO of Cargills Bank Ltd. and the Chairman of the Ceylon Chamber of Commerce. Jagath Pathirane, Director/CEO of Expolanka Freight Ltd. and CAO of Expolanka Holdings PLC was re-elected for the second consecutive year as the Chairman for the period 2018/2019 whilst Roshan Silva, Managing Director, CL Synergy Ltd. and Dinesh Sri Chandrasekara, Director HTL Logistics Ltd. were elected Vice Chairman and Treasurer respectively. The Executive Committee elected for the period 2018/2019 comprises of Ace Cargo Ltd., Expelogix Ltd., DHL Global Forwarding Lanka Ltd., MAC Supply Chain Solutions Ltd., Maersk Lanka Ltd., Mack International Freight Ltd., and Speedmark Transportation Lanka Ltd.
During his speech, Pathirane pointed out, in keeping in line with the observations that he made in his inaugural speech when he was first elected last year that there was a dire necessity then and there is a necessity now to work together as an industry to raise the Logistics Performance Index (LPI) of the country which is stated very low. He further said that SLFFA has managed to work together and to keep to its pledge by working cohesively with all industry colleagues, associations and stakeholders successfully and to face some hurdles and achieve milestones together. Among the guests were officials from Sri Lanka Customs, Ministry of Ports and Highways, CASA, Shippers Council, Past Chairman’s of the association and delegates of member companies.